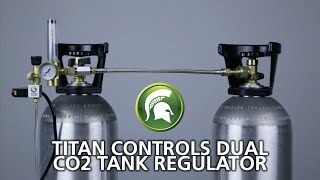 The easiest way is to attach your CO2 Regulator to the tank and open the tank nozzle to allow gas to flow into the CO2 Regulator. DO NOT plug the 120 V Solenoid cord set into power source. Now, using a spray bottle with mild soap solution, spray all connections on the CO2 Regulator. If you see bubbles form, this is where the CO2 is leaking from. Tighten up any connections to seal the CO2 Regulator or call our Technical Service line for more assistance.